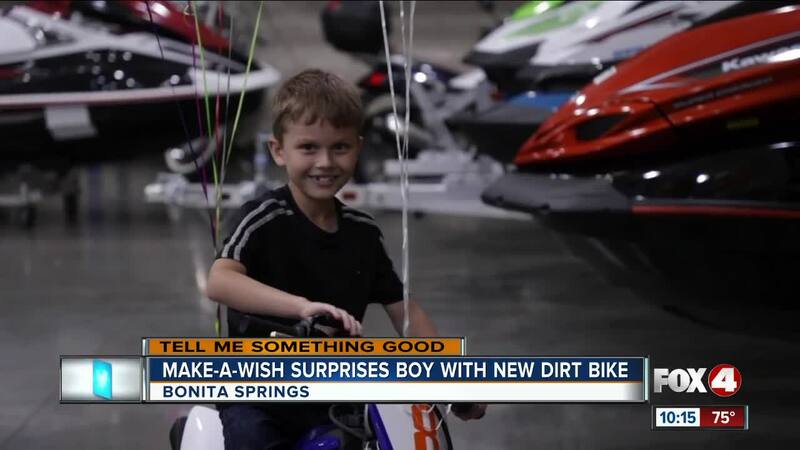 8-year-old received his dirt bike from Florida Motorsports through the Make-A-Wish Southern Florida in Bonita Springs. BONITA SPRINGS, Fla. - Today, Cole Williams turns 8 years old. He ate birthday cake, opened presents, and rode his new dirt bike. “I just love the air blowing through my air and I love going fast,” Cole said. He received his dirt bike from Florida Motorsports through the Make-A-Wish Southern Florida in Bonita Springs. Cole had three wishes: A dinner with President Donald Trump, a trampoline, and a dirt bike. One of his wishes came true. “He’s been asking about this day for a long time. Since they interviewed him,” his dad Gary Williams, said. Since Cole was born, he’s had Hirschsprung’s Disease, a gastrointestinal disorder. His mother Dawn Russell says it’s been a rough few years. “We’ve been in and out of the hospital more times than I can even say,” Russell said. “We nearly lost Cole — in June 2017 he had two emergency surgeries and since then he’s had about 7 more surgeries in the past 15 months and that’s all just to get him back to a ‘normal’. “It’s made him a really strong, strong kid. I mean, he has amazing resilience,” Russell said. All Cole wants to do now is learn to ride his bike — feeling the wind and riding fast. “I… love feeling that feeling,” Cole said.